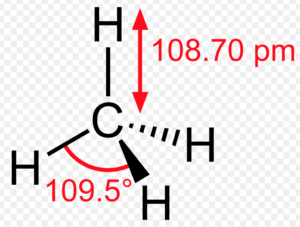 A molecule of methane contains four C-C , σ bonds. It contains 6 C-H σ bonds and one C-C σ bond. The carbon-carbon double bond of ethene consists of a strong carbon-carbon σ- bond and a weak carbon-carbon π bond. The carbon-carbon triple bond of ethyne consists of a strong carbon-carbon σ- bond and two weak carbon-carbon π bond. For π-bond formation, it is essential that the p-orbital on the adjacent carbon atoms must be parallel for a proper sideways overlap. 1) All the atoms directly attached to the carbon atoms of the double bond lie in the same plane. 2) The p-orbital of a π-bond are mutually parallel and are perpendicular to the plane of the molecule. 3) Rotation of one CH2 fragment w.r.t the other interferes with the maximum overlaps of the p-orbitals.Therefore , such a rotation about carbon-carbon double bond is restricted. 4) The electron charge cloud of the π-bond lies above and below the plane of the bonding atoms.This allows the π-electrons being easily available to the attacking reagents.